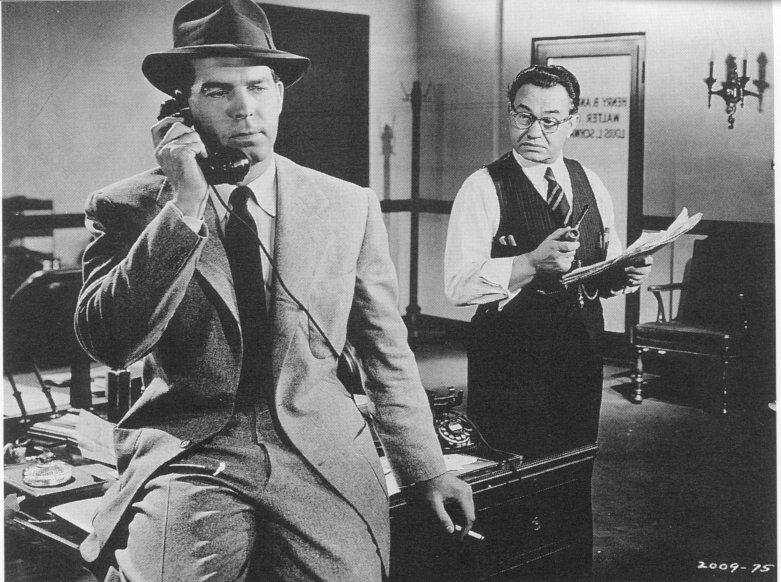 Double Indemnity is a classic film noir. The film noir is a hard genre to define, but it is commonly said to be a collection of Aesthetical Principles and a more cynical outlook during and after WWII.1. Double Indemnity starts with non-diagetic music which installs a sense of urgency and action that mirrors a speeding car. The editing is smooth, as each cut dissolves into another, ensuring a clear understanding that time and space has moved in a linear fashion. The establishing shot of Walter Neff’s workplace stunts this fluid action, the camera then pans right, slowly following Neff into an office; which, conversely to building drama and frenetic action, constructs a sense of suspense. 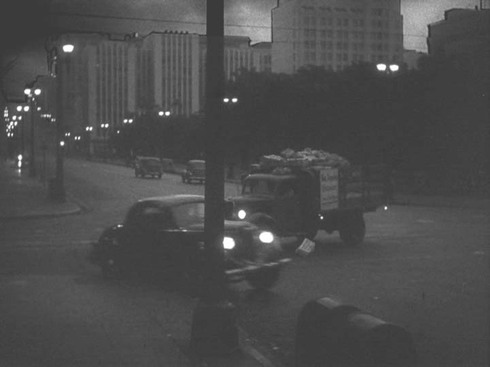 The editing, although linear, manipulates clock time, as the frame speed and scene change slows down as he enters the insurance building, this technique is the editing of a frames’ rhythm between shots. What this editing technique does is change the rhythm and pace of our perception, ensuring we gain a sense of drama and suspense. In film noir lighting is an important aesthetical principle as this give clues to the characters’ function. As Neff enters the office we only see thin bars of white light, projected across his chest, as if he was in a jail. As he switches the light on, the room is flooded with white and all shadows are removed. This technique is called Chiaroscuro2, the artful use of shades in black and white photography. This technique gives the viewer clues about the nature of Neff’s actions; that he is seeking redemption, bringing himself out of the shadows metaphorically, in the form of a confession, into the light. This functions as an instantly identifiable trope which helps the viewer to understand Neff’s character and narrative function as the Male Protagonist – a key component of the film noir. 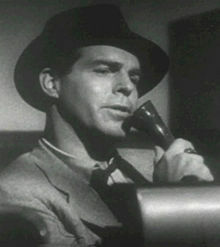 The understanding of characterisation is essential in Classic Hollywood cinema; the opening scene unmistakably uses generic conventions of the film noir to construct Walter Neff, from the lighting of the set, his bare and uninspiring office, the mise-en-scene, and the continuous motif of lighting a match between his finger and thumb. In film noir the narrative is always centred on partial redemption and rationalisation of the male protagonist’s actions. In Double Indemnity this is done through the narrative technique of analepsis, or the flashback. The narrative device of analepsis is a classic film noir device which critic Schrader tells us creates a sense of ‘an irretrievable past, a predetermined fate, and an all-enveloping hopelessness’3 this outlook is culmination of the pre-war depression and WWII. As Walter Neff starts his confession the camera focuses on his face with a medium close-up. The camera position is mimicking the relationship between police and suspect, and although he’s talking into a voice-recorder, we can assume that we are meant to be placed in that moralising position. The combination of chiaroscuro and analepsis gives Double Indemnity a dark, unsentimental vision of America and in this way Billy Wilder’s Film is a classic film noir. 2. Billy Wilder was earlier in his career a German Expressionist, and the expert use of Chiaroscuro is most likely due in part to this fact.